From June 9 to 13 at MIC – Imagin @ terium: Intercoiffur Virtual World – THE DESIGNERS AND DESIGNER FOR EMILIA In the same dates will be held in Rome on 21 ° IDC World Congress (Rome Intercoiffure 2012) a mega-event in which the young protagonists dell’hairdresser express their ideas, showing their creativity and contributing to the continuous evolution and intelligent trends. MIC – Imagin @ auditorium joins the initiative by presenting proposals of some of the designers of Second Life, June 9 to 13 that will put their creations for sale to the public with a 10% discount, and all sales proceeds will go entirely to ‘Emilia. The designers will participate in the filming of a video-machinima that will be subsequently published on the site dell’Intercoiffur. 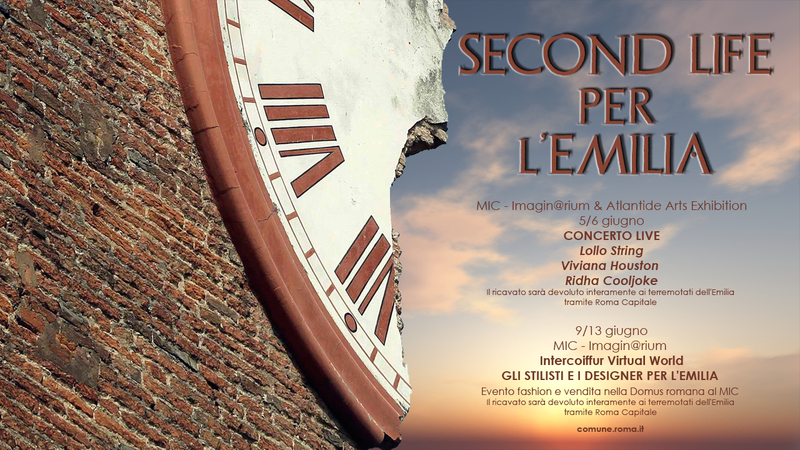 Perciò il 5 e 6 giugno MIC – Imagin@rium & Atlantide Arts Exhibition ospitano un CONCERTO LIVE di Lollo String, Viviana Houston e Ridha Ibrahim, il cui ricavato sarà devoluto interamente all’Emilia, tramite Roma Capitale che ha aperto un conto corrente apposito per la raccolta delle donazioni alle vittime del terremoto. Click sulle iconcine per ingrandire le immagini. This entry was posted in Charity, Awareness, Help & Fundraiser and tagged 3D, 3D people, abruzzo, Art, avatar, Blog, Blogger, Charity, Clothing, Couture, earthquake, eathquake emilia, emilia, Fashion, Fashion in Pixels, fashion poses, Female Clothing, female wear, Formal, formal attire, Fundraiser, Hair, help for Italy, High Fashion, Italy, Japan, Jewelry, meta virtual, Model, model pose, Model Poses, Modeling, Modeling pose, Modeling Poses, New, New Release, New Releases, News, photographer, Pose, Second Life, Secondlife, SL, SL Clothing, SL Fashion, SL Style, Style, Virtual World, Wicca Merlin, woman. Bookmark the permalink.